All transactions are safe and secure with a reliable history in online purchasing behind each of our associates. Buy the Vampire Diaries Damon Logo t-shirt to own Vampire Diaries clothing and merchandise. While Elena Gilbert may not be everyone's ideal girl, the Salvatore brothers think she is perfect. Why you ask? She reminds them of a former flame from the 1860's that they both loved when they were human, Katherine Pierce. A vampire herself, the question of whether she is still alive eludes them. They believed she was one of the vampires killed in the Fell's Church fire during the Battle of Willow Creek but a possible sighting a century later leaves the theory open ended. 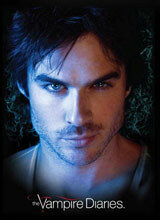 Both vampires like Elena, one good and one evil, but who will win this girl's heart? Grab this Vampire Diaries shirt if your choice is Damon. In addition to the Vampire Diaries Damon Logo tee above, browse the Vampire Diaries Clothing Gallery for more apparel like men's and women's clothes, kids shirts or hoodies.